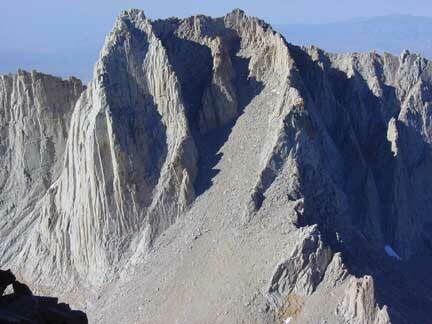 Mount Russell is one of California's 15 Fourteeners. A very nice and aesthetic arête called the Fishhook Arête winds its way up Mount Russell on the peak's south side. The arête is a technical climb of 8 pitches rated at 5.9. 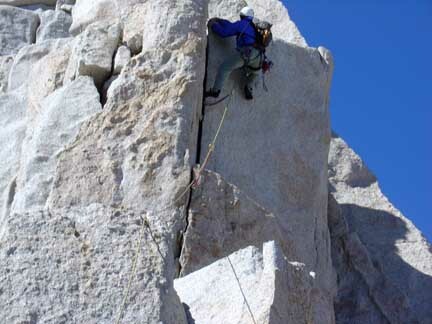 The arête can be broken into to two sections, an upper and lower section, each with four pitches. The lower section contains most of the 5.9 climbing as well as most of the best climbing. 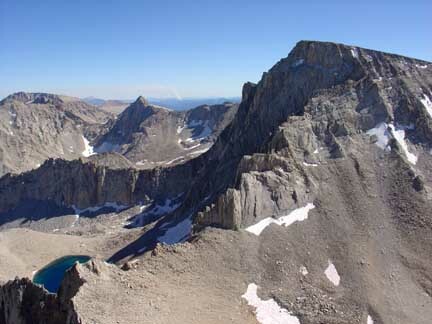 We wanted to climb the route in its entirety from our high camp at Iceberg Lake just below Mount Whitney. We slept in. "Sleeping in" at 12,600' when you had gone to bed at 8pm means sleeping until 7am at the most. The morning was cooler than we wanted it to be for 5.9 alpine climbing so we took our time getting ready for the climb so that the rock would have plenty of time to warm up. So around 8:30am we finally left camp and headed over the Whitney-Russell Pass to approach the base of the Fishhoook Arête. At the top of the pass we had a commanding view of the Fishhook Arête. Very appropriately named! While hiking over the pass we noticed a very steady wind and the cold temperature. It was a clear day but the wind and air temperature kept things chilly. At least most of the climb was in direct sunlight we thought. The approach went smoothly and around 9am we were at the base of the climb looking up the steep but beautiful first pitch. Since Bill lead the first pitch yesterday, it was my turn. I was excited to lead it but wished it was a bit warmer. Oh well. I put my rock shoes on, tied in and took the rack from Bill to start upward. The first pitch starts with some awesomely steep 5.8 cracks moving into 5.9 cracks. The climbing was fantastic and exposed on this steep first pitch. The protection in the cracks was equally awesome and I found myself placing a ton of pro due to the easy, secure placements and the steep nature of the climbing. I wasn't moving particularly fast because of all the pro placements and stiff climbing but it was early and I wasn't in any hurry to get to the 5.9 third pitch which would be my lead in the cold shade of the north side of the arête. Around 15 feet from the top of the pitch I ran out of slings and had to climb the rest of the pitch without placing any more pro. Bill seconding the first pitch to gain the arête proper. I found a nice positive stance on top of the arête proper at the top of this pitch and belayed Bill up. The second pitch was Bill's lead on 5.5 terrain on the arête proper. Very enjoyable climbing lead to a shaded and cold belay ledge. Between the shade and the stiff wind, belays that weren't in the sun were very cold. I followed the second pitch up to Bill and eyed the third pitch. The SuperTopo guide for this describes moving left into shaded ledges to find the easiest ledge to take you to the top of the pitch. It warns that if one goes too far left you'll end up in a maze of ledges and if you stay too close to the arête proper, the climbing is harder than 5.9. I started off the pitch and stayed on the arête for the first 15 feet before moving slightly left. Looking at the ledges to the left, none of them looked particularly good. I looked right and the climbing on the arête looked much more appealing (and it was in the sun!) so I went with that option. It appeared that I would have to make two difficult moves before reaching easier ground-one to step onto the arête proper and one move up higher. The move onto the arête was protected by a good yellow Camalot and was more awkward than hard. Once I was on the arête I was rejuvenated by the sun warming my hands and face! I made a few moves upward before coming to the second hard move of the pitch. I was able to make a good cam placement and reached up high to a good hold before committing to the move. It was steep but not anymore difficult than 5.9. However, I'm 6'5" so this section could be more difficult for those that are shorter. Easier ground lead to a sloping ledge in the sun where I found a piton. Having just pulled through one of the crux pitches of the climb, I didn't explore any further and used the piton along with a good nut placement as the belay anchor. Bill followed up and agreed that the second "hard move" would be difficult for shorter people but that overall, the climbing on the arête wasn't too difficult. As he started up the fourth pitch, he got about ten feet up and found an awesome, sunny and wind-protected ledge and suggested we move the belay up. Eager to get out of the wind, I gladly followed his suggestion. Once we had moved the belay up to this higher ledge, we spent some time just sitting there enjoying the windless and sunny ledge as we warmed up. We were both very chilled after the third pitch. It had taken me a while to lead it and Bill had spent a large amount of time at the cold belay ledge. We also knew that the next belay would be in the windy, cold notch between the lower and upper portions of the arête. As the day previous, the weather was awesome and there wasn't a cloud in the sky so we weren't concerned about having to move quickly. After becoming sufficiently warm again, Bill set off up the 5.4 arete climbing and made short work of pitch four, setting up his belay on the ledge above the 5.8 downclimb into the cold notch below pitch 5. The downclimb was supposed to be tricky but short and it was suggested to "down lead" this downclimb so Bill wanted to have a belay from above for the 10-foot downclimb. I followed pitch 4 efficiently and then belayed Bill down into the notch. The downclimb may have been 5.8 but it was only 10 feet to a fairly generous platform in the notch so it went smoothly. Bill didn't place any pro while downclimbing as it required large gear and placements would have difficult anyhow. He helped guide my feet as a downclimbed. Plenty of decent foot placements and a solid hand hold in the crack on the downclimb made it straight forward. We were now looking up the steep but extremely featured fifth pitch. My lead. It looked so steep it was hard to believe it was only 5.6 but the bomber knobs, flakes and cracks made the climbing fun and enjoyable. 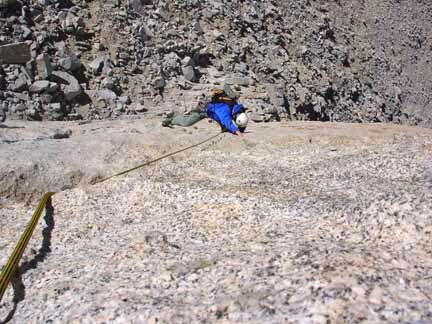 The top of the pitch was a spacious belay ledge and I brought Bill up. By now we had both warmed up a bit and the wind seemed to have subsided. There was still a slight breeze but sitting on the giant ledge in the full noon-day sun, we were happy. Bill got the next lead up a wide and hard to navigate chimney rated at 5.8. He made fast work up into the chimney but seemed to slow down a bit in the middle of the feature and then moved swiftly through the rest of the chimney to the belay. As I followed I could see why he slowed down. The chimney was fairly tight with our packs on and I had been using the biggest cam for the belay where it would have been more beneficial to Bill on lead. Impressed with his chimney skills, I arrived at the next belay. Looking up pitch seven, it appeared to be some very exposed face climbing and a lot more thin than what we had been climbing. I started up, got on top of a large block and stepped across 600 feet of air to a ledge on the face. The exposure was immense and grabbed my full attention. I placed a green camalot in the left crack and then moved right along the ledge to very edge of the face. The climbing above was only 5.7 but with the huge exposure below, it felt harder! I saw the moves and knew that all I had to do was pull on a couple of small knobs and get my feet on top of those knobs. Trust the hands, trust the feet-never mind the exposure. "Remember, you love exposure," I thought to myself. I worked the moves in my head, started up and then backed down to the small ledge. I looked harder for another pro placement and squeezed a purple camalot into a small hole right on the right edge of the face. A gray camalot would have fit much better but it was Bill's turn to be using the best cam for the belay. With the mental security of being right at the protection, I finally stepped up and made the moves to the top of the face. "What the hell were you worried about? That was nothing," I thought to myself. "Just make the moves." I made way to the top of the pitch on easier ground, hung a sling around a large horn for the belay anchor and tied into it. The belay ledge was very generous. This route had wonderful ledges for all belays! Bill making the moves through the small dihedral on pitch 7 just below the belay. Bill followed up and had no issues at all with the 5.7 face climbing as he was on top rope. But it was his turn for some fun. He started up the eighth, and final, pitch to the summit. It started out as nice 5.6 climbing with a short traverse on the arete's east side up to the crux 5.9 10-foot high hand crack in a short dihedral. The crack looked beautiful but was steep and committing. Bill was able to reach high and place a red camalot in the crack before committing to the moves. From my vantage, the crack looked like a perfect hand-jam crack but as Bill started up, he went straight into a layback to the right. 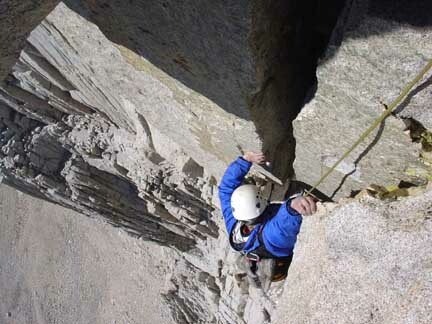 At that time, a woman and a man popped their heads out from the summit (they had climbed the standard 3rd-class East Ridge route) and watched as Bill went through the crux. Bill pulling through the short but stout 5.9 moves of the final pitch. Working up, he topped out of the crack onto the huge ledge above and gave the thumbs up. The climbing must have gotten easier after that as he cruised quickly to the end of the rope and setup a belay. He raised his arms in triumph and exclaimed that he was just below the summit! I started up after him and arrived at the 5.9 crack. I stuck my hand in it and knew that I would certainly be jamming it instead of laybacking. It was a perfect hand crack and the stemming in the dihedral would be awesome. I got into it and enjoyed the awesome moves so high up on the final pitch and met up with Bill near the top. We coiled the rope, changed shoes and climbed atop the west summit of Mount Russell at 3:15pm. Again, we could see the smoke of the fire burning in Kings Canyon NP but it certainly did not hamper our view. The view of Mount Whitney from Mount Russell was impressive. The climb had been awesome and to climb such a great route directly to the summit of a California 14er was wonderful. Looking south at Mount Whitney from the summit of Mount Russell. We signed the register, snacked and then headed over to the east summit of Mount Russell as we didn't know which one was higher and wanted to make sure we had our bases covered. Plus, the descent route is in a south-facing gully that descends from the mid-point of the ridge between to the two summits. After summit photos on the east summit, we headed to the gully and made our descent. The descent involved a short bit of fourth-class down-climbing on good rock before moving into loose dirt and scree the rest of the way down. The view of the Fishhook arête on the descent was very impressive. After going back over the Whitney-Russell Pass, we got back into camp around 5pm. We cooked up a dehydrated meal and enjoyed watching the sunlight fade away for the day before going to bed. 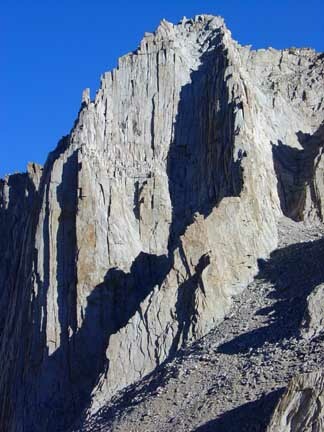 The next day would have us descending from camp down to Lone Pine to eat a good lunch and catch a shower before heading north to Onion Valley to make the long 12-mile approach that afternoon to the base of Charlotte Dome to climb the classic 5.8 South Face on that magnificent dome. As an aside, we showered at Kirk's Barber Shop in Lone Pine as it was the only place we could find to shower. Showers cost $4. While it was refreshing, Kirk's bathhouse leaves quite a bit to be desired. The three showers were very grungy with clumps of hair in the corners, cobwebs above and flimsy shower walls coated with dirt. A sign in the bathhouse from Kirk read, "I hope you enjoy my bathhouse. I built this bathhouse in 1975." Some frustrated patron had taken a pencil and inserted, "and haven't done a thing to it since then!"